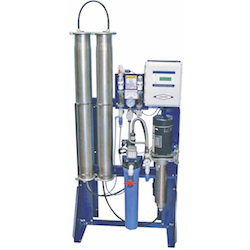 CWM Series RO systems come in one- and two-vessel models. They are rated at 1,500 and 3,000 gpd. Both models are built with stainless steel frames and pressure vessels, and have multi-stage stainless steel centrifugal pumps. The systems also come with an electronic controller that simplifies operation.